A academic lecturer, coach, graduated from the Faculty of International and Political Studies of the Jagiellonian University. 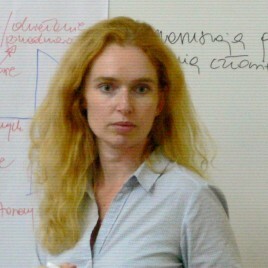 She collaborates with the Institute of Middle and Far East of the Jagiellonian University in Krakow, runs the company Laboratorium Kultur specialising in training provision and inter-cultural communication. Expert in the aspects of development and humanitarian aid, in inter-cultural communication and global education, closely watching the processes of modernisation in Africa and Asia. She has carried out research in aid themes in Morocco, Sri Lanka and India. Author or co-author of many research and popular science papers.